When is the best moment to fly with your drone (windspeed and direction). When the Sun gives the most beautifull light to photograph (bluehour, golden light, etc). What's the Sun angle at a specific moment in time. Will there be a chance on an Aurora (polar light) tonight (High Kp-index). Can we expect GPS disturbance (Kp index) handy for drone operators. When is the best moment to sport outside. 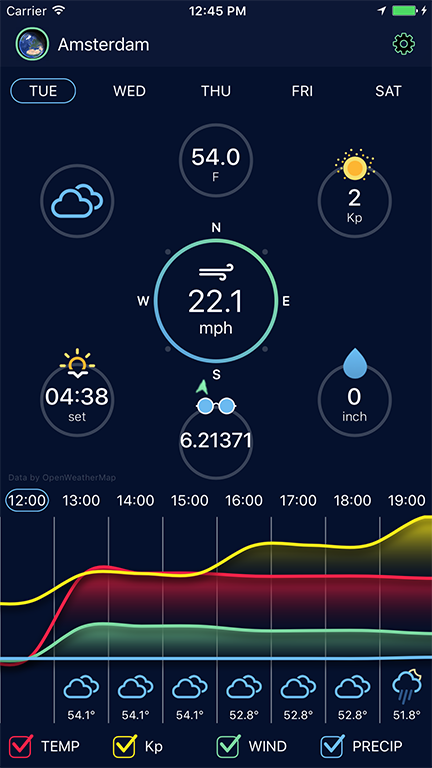 Fully customize the boundaries yourself to create your own weather advisory, no matter where you live on earth. Available for iPhone and iPad in the AppStore right now! Runs on iPhone, iPad and Apple Watch. New Nexus Mobile for the great App design! Openweathermap.org for it's weather data. US Government for the solar activity info. Science for creating the sun angle calculations algorithms. Apple for hosting this weather App and providing the development tooling.